I remember the first I saw an overlock machine. It looked very complicated and intimidating. I was sure I would not be able to learn to use one. But, surprise! It wasn’t nearly as difficult as I thought it would be and before long, I couldn’t sew without one in my sewing room. I may not use it every day, but I love it for its speed and professional-looking seams. And then I found out about overlock presser feet. Every BERNINA Overlocker comes with a standard presser foot that works for most every day techniques. 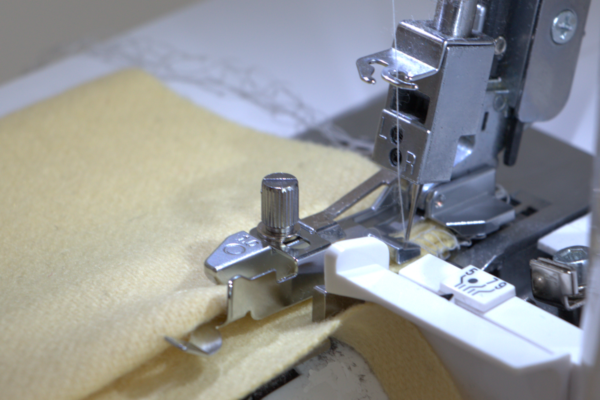 Overlockers do lots of practical techniques such as seaming, hemming, and seam finishes. 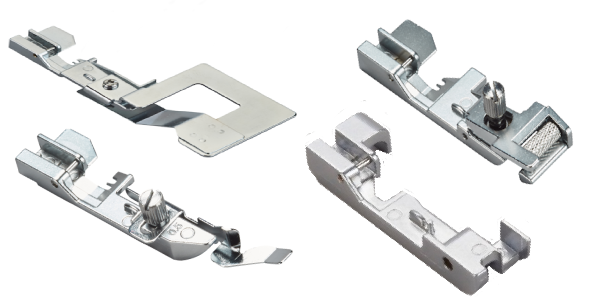 When you add specialty presser feet to the machine, you can expand the creative possibilities it offers. 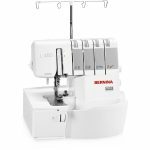 The current BERNINA overlock machines, models L 450 and L 460, have five additional specialty presser feet that let you get creative. 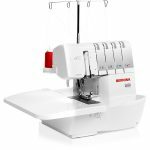 Gathering with the overlock machine is fast and easy. If you have a project with yards and yards of ruffles, such as a bedskirt, curtains or a little girl’s dress, using the overlocker is the fastest way to get the job done. 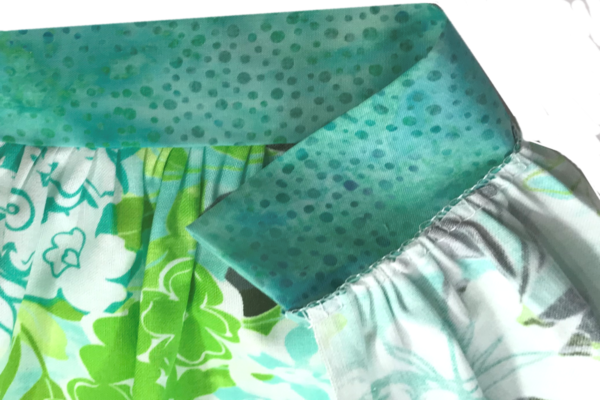 The gathering foot not only does simple gathering but will also gather one fabric while stitching the gathered edge to a flat piece of fabric. The photo below shows the fabric to be gathered placed under the foot and the flat piece of fabric between the foot and the flap on top of it. Here’s the finished gathered piece stitched to a flat piece of fabric – all in one operation! 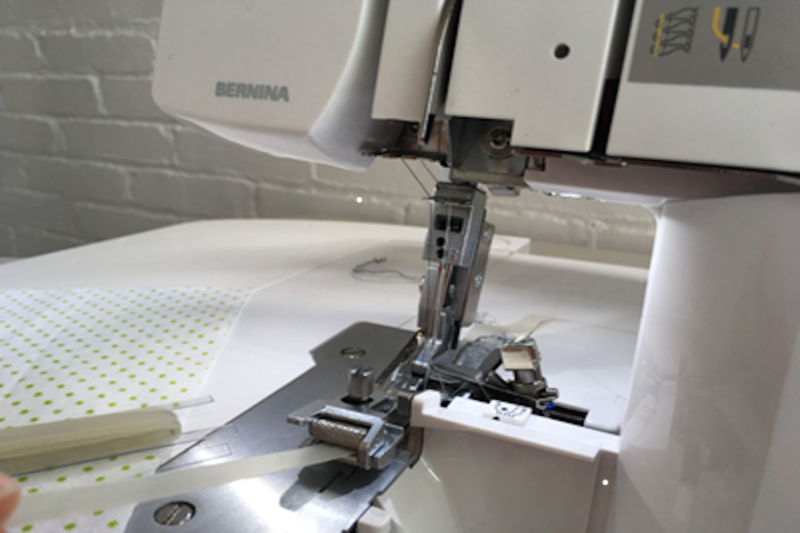 There are several ways to use an overlock machine for hemming. 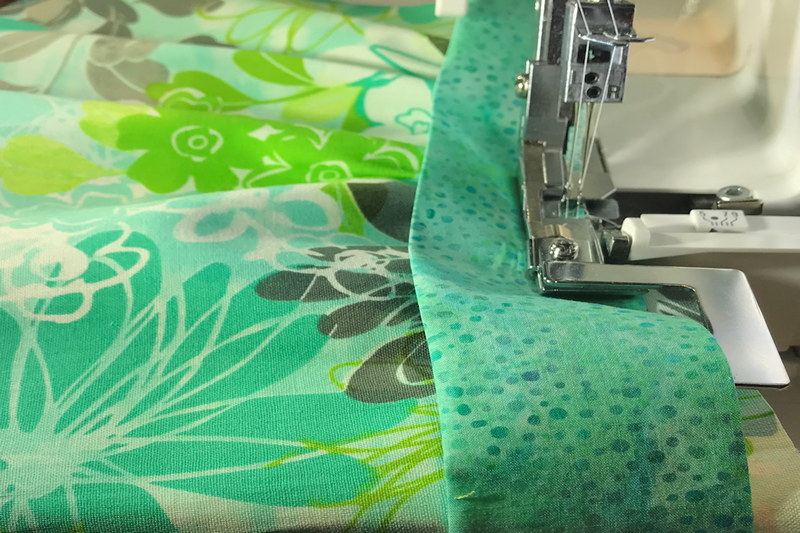 The blindstitch foot works on almost all fabric weights and lets you turn up a hem in the depth that works for your project, from tablecloths to skirts to custom-made draperies. This foot is available in two sizes, one for stitching light to medium weight fabrics (0.05) and one for medium to heavy fabrics (1.0). Click here for directions on hemming a t-shirt using the Blindstitch Foot. One thing (and there are many) that the overlocker does really well is stitching elastic. The elasticator is a foot that is very useful when stitching swimwear, lingerie, and dance wear. It works with narrow elastic and actually stretches the elastic for you as it goes under the needle. It works with clear elastic, braided elastic and other types of narrow elastic. You can tell by its name that this foot has a lot to offer. You will be reaching for it when you want to sew piping, attach beads, insert zippers, and more. 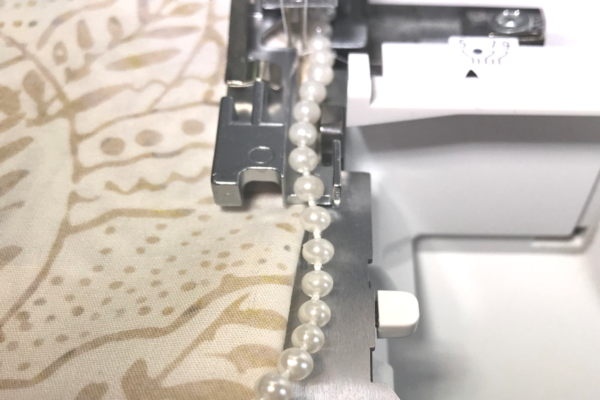 It has a channel that holds dimensional items such as cording, beads, and zipper coils so they are easily fed and incorporated into or next to the overlock stitch. Click here for directions on using the Multi-Purpose Foot to insert a zipper in a pillow. So, if you have an overlock machine and have not explored what you can do with the accessory presser feet, I encourage you to go to your local BERNINA store to check them out. As much as you use your overlocker, you’ll be using it even more when you have these handy tools in your overlock toolbox!